Chicken Fat: Adios Fidel Castro! 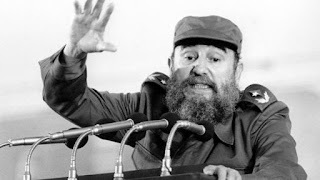 Fidel Castro my archenemy; my arch villain, is dead. When our country was threatened by the Cuban Missile Crisis, I stepped up between Fidel and John F. Kennedy, with my cape blowing in the wind, held out my hand like I was halting a runaway mad-man swinging an ax and said, "Not so fast Fidel!" In other words, Fidel is the reason I joined the Navy. Racists Running and Walking Shoes?